Here’s another children’s Christmas story. 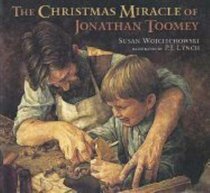 The title is The Christmas Miracle of Jonathan Toomey by Susan Wojciechowski. This touching story is about a wood carving widower who is asked to prepare a new Nativity set for a widow and her young son. The illustrations are well done and the story even more beautiful. This book would make wonderful gift for a child who enjoys books. This entry was posted in Uncategorized and tagged Books, Christmas, Nativity, Susan Wojciechowski, The Christmas Miracle of Jonathan Toomey. Bookmark the permalink.